No blackboard this week as most of my eating was done back in Italy, a quick visit back to sort my epic wedding menu (WAY too important to do any other way than face to face.) Along with the general anxiety of planning, the fact that noone had told me the bell tower of the church I had booked had become unstable due to the earthquakes, thus rendering it closed, required me to do a lot of much needed stress eating. At least I was in the right place to do this in. I love eating patterns in Italy. Breakfast is a mere milky coffee and biscuit or brioche, preparing you for pranzo, essentially lunch with bells and whistles. Pranzo in our house consisted of a pasta primo and meat secondo on most days. I won't write everything we ate down as it would take an hour to read, but highlights were some fantastic wild spinach, picked that morning from the mountains and simply dressed peasant style and a hearty thick pasta ravioli (thick enough to disgust any Michelin starred chef but that's how it's made here) filled with local goat ricotta. Ricotta is typically made with cow or sheep milk but I adore this strong goat version, a world apart in taste and texture to the sloppy ricotta in the supermarkets. But I suppose what your really asking is what the hell is that in the first picture? Well it is a savoury "pie" from Naples, brought to the house by a visiting Neapolitan lady as a belated Easter gift. 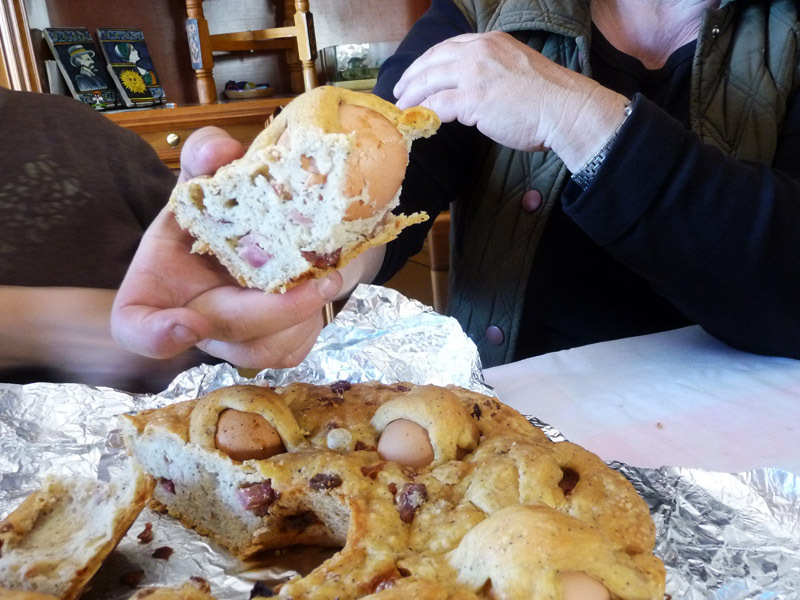 Encasing whole eggs like this is a common Italian Easter tradition. In our region for Easter we bake an egg in a similar way but it is encased in the centre of a large flat bread in the shape of a woman (given to little girls) and horses (for little boys). This pie had chopped smoked pancetta and was heavily peppered. 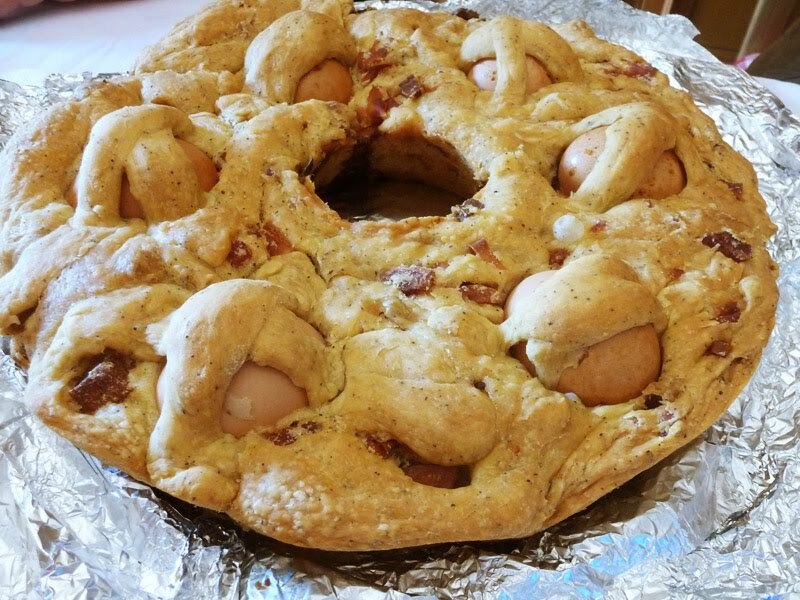 These types of pies were traditionally baked to be taken on Easter Monday picnics, as they really are a whole meal in themselves. Goodies brought back this time were 4kg's of amazing sausages from the local butcher in the village. These are dropped into bubbling tomato pasta sauces to flavour them, and then the sausages are eaten after as a secondo. 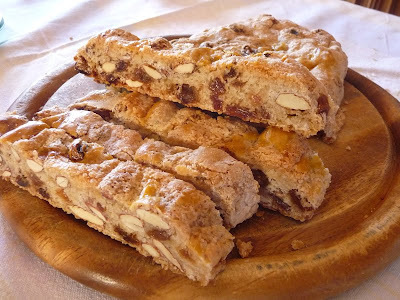 Thety are also good grilled or oven roasted and served with salad and potatoes roasted with rosemary. 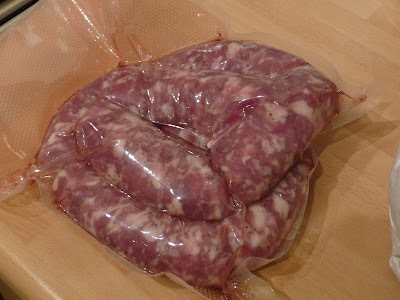 Although very coarse, the sausages are pure meat and spicing. My family have invested in an industrial vacuum packer so we can bring this stuff back! 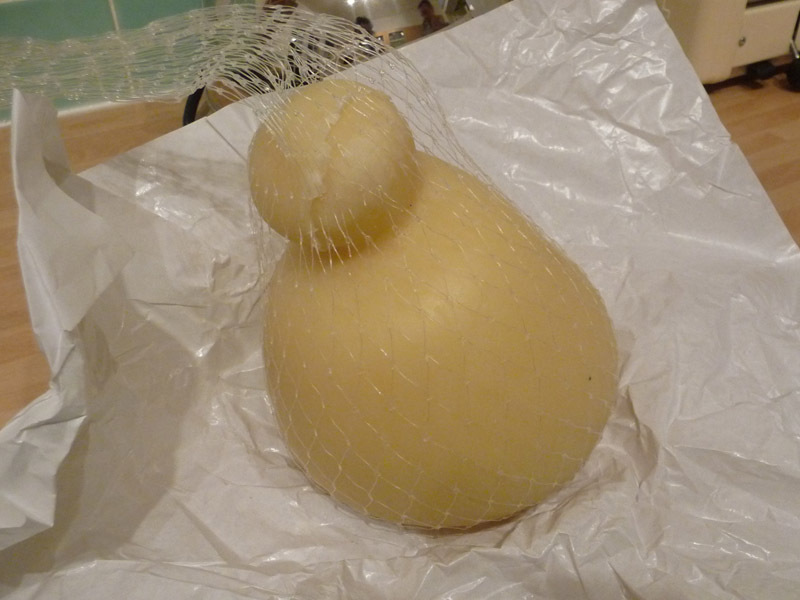 One cheese I've never seen in the UK is the Caciocavallo, a fantastic sheep milk cheese. Shepherds used to make cheese in the hills on the move when relocating the sheep to higher or lower ground for the winter or summer. The unusual shape is due to the way the cheese is hung, traditionally shepherds would string them over horseback to carry down to the villages for sale. 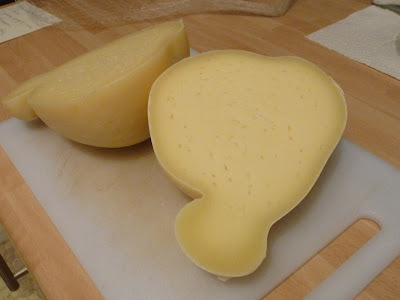 Cacio is an old dialect word for formaggio, meaning cheese and cavallo means horse. This caciocavallo is made in the next village to us and is the best money can buy.